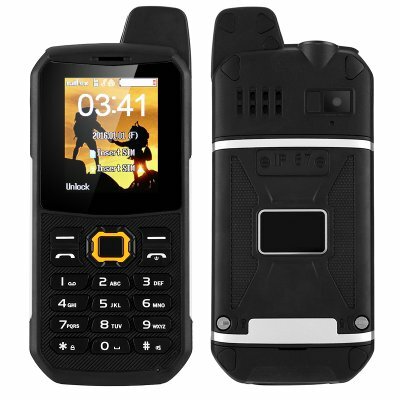 Successfully Added Rugged Outdoor Phone - IP67, Dual-IMEI, Walkie-Talkie, Camera, 3000mAh Battery, Power Bank Mode (Black) to your Shopping Cart. This Dual-SIM rugged phone is the perfect cell phone for everybody who likes to spent their time outdoors yet, at the same time, likes to stay connected to friends and family back home. Featuring a fully rugged design, this mobile phone is protected against water, dust, drops, low temperatures, and a whole lot more. Designed to withstand the toughest of environments, this tough cell phone will follow you where ever you go. Perfect for those who work in tough environments and for outdoor enthusiast, this rugged phone keeps you connected wherever you are. With its 2.2-Inch display and large keys, this cell phone is easy to use and operate. Its extra bright display ensures that you’ll be able to read message even while located in direct sunlight while its large buttons allow you to operate your phone even with gloves on. Packing a massive 3000mAh battery, this Chinese cell phone provides you with an absolutely stunning 60 hours of continuous usage time, enough to get through multiple days without ever needing to worry about battery life. A standby time of 12 days additionally allows you to head out into the wild with confidence as, with this rugged phone at hand, you’ll always be within reach to friends and family. Besides providing you with tons of energy, this amazing battery can also be used to charge other devices in case of an emergency as your phone allows itself to be used as a portable power bank. Featuring Dual-IMEI numbers, this rugged phone allows you to be reachable on two different phone numbers while using just one device. No matter where you’re headed, from now on you’ll be able to throw in a local SIM card to improve connectivity while, at the same time, stay connected to friends and family back home with your old, trusted, domestic phone number. For the real extremists that like to head deep into the wild, this rugged phone also supports a walkie-talkie feature, allowing you to stay connected to fellow outdoorsmen in the area in remote places where there is no mobile network available. Packing a sophisticated 0.3MP camera, this rugged phone allows you to snap pictures of your upcoming adventures – ensuring that not a single special moment on your trip will stay uncaptured. With the possibility to throw in 8GB of external memory there will be enough storage for you to save plenty of pictures snapped during your upcoming road trips and nature hikes. With this phone you’ll always be able to capture those special moment and share them with your friends and loved ones once you’ve headed back home after your time spent in the wild – allowing you to share your experiences and giving them a taste of nature without having to actually leave their home. Thus rugged GSM phone comes with a 12 months warranty, brought to you by the leader in electronic devices as well as wholesale electronic gadgets..
Its a great product and Im satisfied with the packaging and easy use. Thanks.